Has Pakistan army ever expressed their will to take over the government by their acts or statements after General Musharaf resigned from the designation of President? Or has any on duty general or officer of army criticized political government in spite of protest and requests from the public? Then why always generals are being threatened that if they tried to overturn demon-crazy (democracy) in the country, they will not be able to avoid Article 6 of constitution. This is good, if anyone breaks law, he should be punished accordingly, but this is also part of the Pakistani constitution that anyone trying to weaken or defame an important department responsible for defense and safety of the mother land like Pak-Army will be a traitor and enemy of the motherland. But alas! These crazy politicians, who get out of control when their mistakes are highlighted to them, are busy in defaming Pakistan army on the bases of few past infamous decisions of leadership of armed forces (for which the political leadership of that time was also equally responsible). Not only these politicians but pro-Indian so-called intellectuals, journalists expert in yellow journalism, are also leaving no stone unturned to develop hatred against Pak-Army in the hearts of public. Now this conspiracy has taken the form of Memo Scandal. Now on this such a powerful propaganda campaign has been started that poor public who is already target of state torture in the form increasing fuel prices and utility prices had forgotten to protest against these mini-budgets in struggle to understand Memo-Scandal. 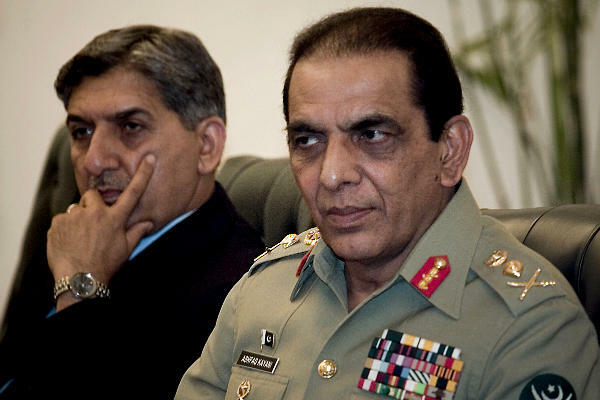 However this is now understood by literate as well as illiterate Pakistanis that only purpose behind this memo-gate is to weaken the position of leadership of Pakistan army and destroy the morale of soldiers so that they accept irrational demands and give up their solid stance for the defense of the country. Possibly Hussein Haqqani might be innocent but at least there is some force which has forced from analysts to representatives in the assembly to speak against or in favor of Pakistan army, and in both cases the only purpose is to start criticism over Pakistan army. Was Memo Gate just to target these two pesons? Is this the first time that few immature or persons having complex that they are over clever, persons having knowledge of legal and constitutional duties of the army, have tried to encourage a foreign power to attack or weaken the soldiers deployed to protect the motherland? Then what is the reason that generals of Pakistan army overthrow the govt. 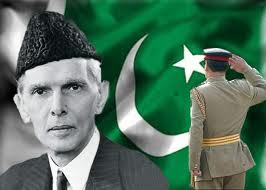 to take the control of the country or like in the present time not only Pakistan army is fulfilling its legal and professional duties, protecting country from internal and external threats, writing a new chapter of sacrifices, and in spite of all this the traitors are busy in their conspiracies to weaken and defame army. So this is clear that memo scandal is not the name of just a conspiracy but a undeniable bitter reality, an anti-Pakistan thinking which was seeded into Pakistan right since 1947, by India in the form of pro-Indian elements. When most part of Kashmir was saved from falling into the hands of India by resistance of Pakistan army, and India realizing the power of Pakistan army to defeat India in spite or shortage of resources, India took Pakistan army as a threat to its damn imperial plans and started a propaganda campaign. If we look at the role of the present leadership of army, Army Chief had ordered army officers to avoid pressurizing or interfering election process in spite of General Musharaf being President at that time. If he had not kept away from election process perhaps different faces had been in power. 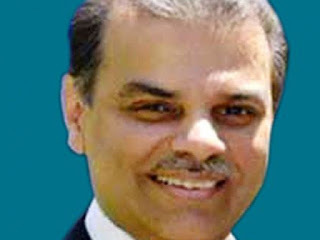 In spite of all this the reports of anti-Pakistan army lobbying by an American citizen and ex-Ambassador of Pakistan to USA are well known. That is why defense analysts are not ready to accept accuses of US Generals and media against Pakistan army and are doubtful over US claims against Pak-Army. For example few weeks ago head of envy of American Homeland Security, Michael, after a meeting with President of Pakistan, talking to the journalists said that Pakistani President has promised to take action against Haqqani network. In his press conference he expressed concerns as well that perhaps Pakistani President is not powerful enough to fulfill his promise. In the same way Americans have gone so far in their conspiracies against Pakistan army that candidate for American President and Governor of Texas Rick Perry, said during his discussion over American foreign policy that he thinks that real rulers of Pakistan is Pakistan army which is untrustworthy in spite of politicians (who are looting resources of Pakistan and transferring them in US banks, moreover these politicians are having dual nationalities i.e. they have also oaths of loyalty with USA). 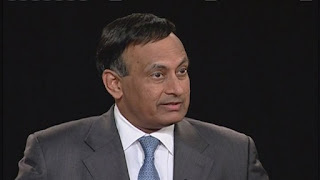 Hussein Haqqani: US Citizen or Pakistani? A memo disclosed by Tehmina Durrani which contains much more dangerous information then today's Memo! “I came to know the links between Mustafa and India in 1980, I was expecting birth of my son Ali, in those days. During the marriage of my sister Zeenah, Mustafa departed for India, he brought many clothes for me and he returned back as their agent as well. He told about his meeting with Indira. He went to meet Indira, it was daytime, he was made to sit in the long room. Indira entered into the room, she was simple, she was straight forward in explaining her plans, it was never felt that she wanted impress or pressurize, and it was easy to deal with her. They talked for hours about restoration of democracy, and murder of Bhutto. They talked about Pak-India relations, about reasons of enmity between both countries, and analyzed the race of weapons which was just a deal doomed to end in loss. Indira was of the view and Mustafa agreed that tension over borders was in the favor of Pakistan army, army is eating up already scarce resources of Pakistan. Due to army Pakistan was not developing rapidly. Army was keeping our public poor, who were neither able to afford good food nor good clothing, they were even deprived of houses. Army was creating obstacles in the establishment of democratic institutions, and looked politicians doubtfully. They arrived on that decision that number of armed forces will have to be reduced, if Pakistani forces are decreased, India will be able to use its resources for economic and industrial development. India wanted to become a great economy and this could have been only fulfilled if she got rid off Pakistan army. Indira was well aware that Pakistani army will never give up its interference in government, so only solution was to badly defame Pakistan army by defeat in the war. “we will have to crush and humiliate your army, only after this peace among both countries is possible, only after this you will be able to restore the rule of civil law in your country. 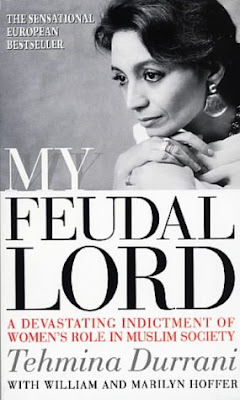 ” Such thinking like Indira Mustafa had already heard from Bhutto, he always used to say that only after defeat in the battlefield army will give up control to democracy. His thoughts proved true in 1971 and his theory became further authenticated in his followers hearts. Many members of Peoples Party took it as only solution and Mustafa is one of them. Mustafa’s relation with secret Indian agency RAW, Indira Gandhi and after her murder with Rajeev Gandhi resulted in lower level treachery within army, all this is discussed in this book with detail that how Mustafa succeeded in establishing links with few lower level officials in Pakistan army who were unhappy with General Zia, and were of the view that army has no place in politics. These meetings started with the meeting of Mustafa with an army officer who was in London on holidays. After establishing trust on each other the conspiracy of murdering Zia and his colleagues with remote control bomb was planned. Anti-army elements were very happy that after success of the conspiracy a suit will be brought into the court against those involved in 1977 army take over. Generals will be hanged with electric poles. Army will be humiliated and defamed (as their Hindu masters wished) and even those civilians will not be spared who favored army. The detail of smuggling of weapons from India, arming young officers with these weapons, conspiracy and its failure are discussed in this book. The dance of Josh over the report of designating General Kalu as ISI Chief after seven years of his retirement is discussed with detail and the court martial and punishments of those involved in this conspiracy is mentioned as well. If anything that is not mentioned is that now who, where and how is busy in conspiracies against Pakistan army. Sometimes in the name of democracy and sometimes under cover of threat for peace in south Asia, a nonstop propaganda campaign on international as well as local level is going on. The secret behind our enemies success is that they find out traitors from Pakistan to criticize and defame Pakistan army. Not only this these elements are given full coverage over international level and well paid. You had already read about the book of Dr. Ayesha Siddiqa in my columns (which has been ignored and forgotten along with the end of Musharaf’s regime). 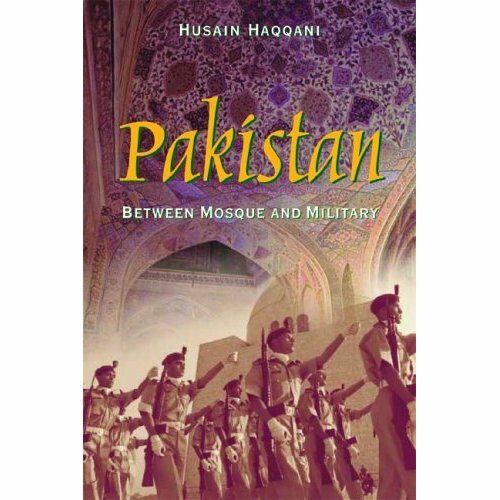 Now a US think tank, “Smith Richardson Foundation” has claimed that they had paid $100,000 net to Hussein Haqqani to write this book against Pakistan army. This book was written by Haqqani in two years. Many points expressed in the memo which has become a dispute are same which Mr. Haqqani has expressed in his book. Smith Richardson Foundation said that Carnegie Endowment For International Peace (which works for international peace) was paid $150,000 in 2004 to prepare a comprehensive report over US policies for Pakistan, this above mentioned think tank then hired Hussein Haqqani for $100,000. All details about the book Haqqani are present over the website of Smith Richardson Foundation. Here this has been clearly mentioned that how Hussein Haqqani got ready to writhe about the links between Islamic Extremists and Pak-Army and their effects on US security. 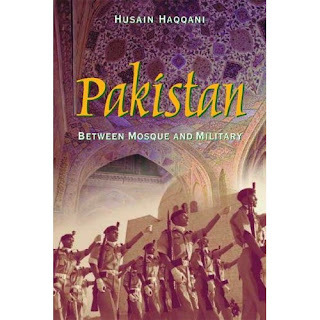 In 2005 when Haqqani published his book ‘Pakistan between Mosque and Military’ he successfully hid this truth that he had written this book for $100,000 against Pakistan and Islam, and that he had advised USA that in spite of lending attention to health and education she should be concerned about Pakistan army’s nukes and rejection to democracy. All these books had been sponsored by USA with reference of shameful US defeat in Afghanistan, whether it is Military Incorporate written by Dr. Ayesha Siddiqa, Decent into Chaos by Ahmad Rasheed, or Hussein Haqqani’s book. Only reason behind heavy bribes to these traitors was to defame Pakistan army on the international level and pressurize Pakistan army to join western terrorists in genocide of Afghans. But imminent of these books of conspiracies is that they have clear and deep imprint of Indian propaganda campaign on them. 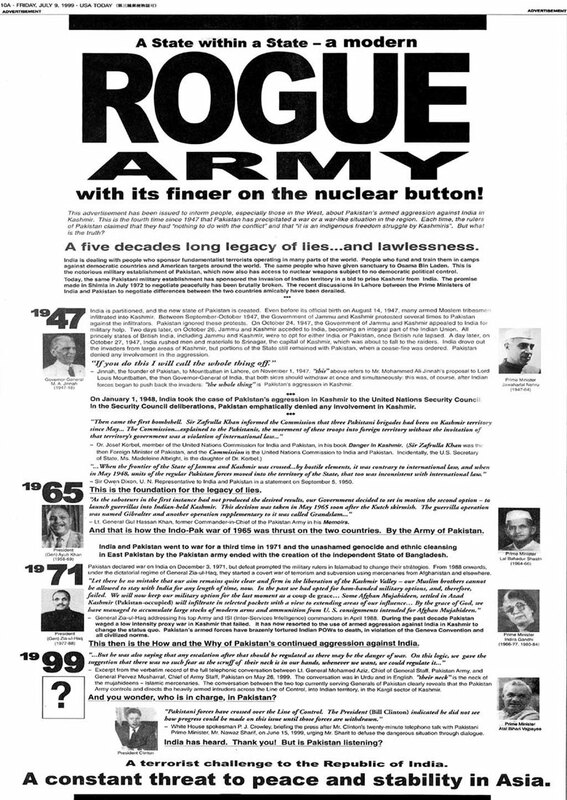 Whether these are books, columns or articles written against Pakistan army and ISI their summary can be viewed in the Indian sponsored advertisement published in ‘USA Today’ in July 1999. 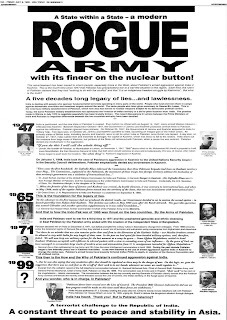 The title of the advertisement is ROGUE ARMY and sub title is WITH ITS FINGER ON THE NUCLEAR BUTTON, in the whole propaganda advertisement tries to misguide public that Islamic extremism is not only dangerous to India but to the whole Asia. They have tried to prove that Pakistan army has established a state within the state, in the whole page costing $75000 Pakistan army has been termed with all except abuses. “MY saddest experience in traveling abroad was the funeral of the Shah of Iran in Cairo, in July 1980. No one was sent from Washington to represent the United States at a funeral for a leader who had been one of our staunchest and most loyal friends. I was reminded of a haunting remark that President Ayub Khan of Pakistan made to me in 1964. In commenting on US complicity in the assassination of President Diem of South Vietnam, he said that event proved “that it is dangerous to be a friend of the United States; that it pays to be neutral; and that sometimes it pays to be an enemy.” Our problem is that we don’t learn from our past mistakes”.